Issue: I've created a block session but I want to edit certain parameters. Is this possible? By default, Freedom sessions are set up so that most parameters cannot be edited while your session is active. Additionally, sessions cannot be deleted while they are active. This is intentional, to make it harder to get around your blocks, and this is how your account will function even with Locked Mode turned off. To further clarify, here is a list of what cannot be modified in an active session. If you would like to edit these parameters, you can contact support (via the green chat bubble in the bottom right corner of the screen or via email at support@freedom.to) and we can delete your session so you can create a new schedule with your desired edits. We can also add devices to your active schedules! Alternatively, you can wait until your session is inactive (for start later and recurring sessions). When your session is inactive, you can fully edit and/or delete your sessions as needed. Finally, there are some key factors that can be edited to control your session! Blocklists can be edited, meaning you can remove sites you need to access temporarily, add new sites to be blocked, and so on. Even though active sessions cannot be deleted, you can change your blocklists to access what you need when you need it. NOTE: Locked Mode must be turned off to edit your blocklists! Issue: If I can edit my blocklists and remove sites, what's to stop me from removing all sites to get around my blocks? Alternatively, I don't want to be able to edit my blocklists! Good question! That's where Locked Mode comes in. Locked Mode will disable you from editing your blocklists and stop you from deleting your devices while in an active session. Check out our Locked Mode Article here for more info. Inactive Recurring Sessions and inactive Start Later sessions can be fully edited! This includes changing start/end times, adding or removing devices to the sessions, adding or removing blocklists to the session, etc. Inactive Start Later and Recurring Session sessions can also be deleted while they are inactive. Stuck in a 24/7 recurring schedule with no end time? Need to make changes to your sessions ASAP? Just shoot us a message via the green chat bubble in the bottom right corner of the site or shoot us an email at support@freedom.to and we'll be happy to delete your session so you can recreate it with the desired changes! 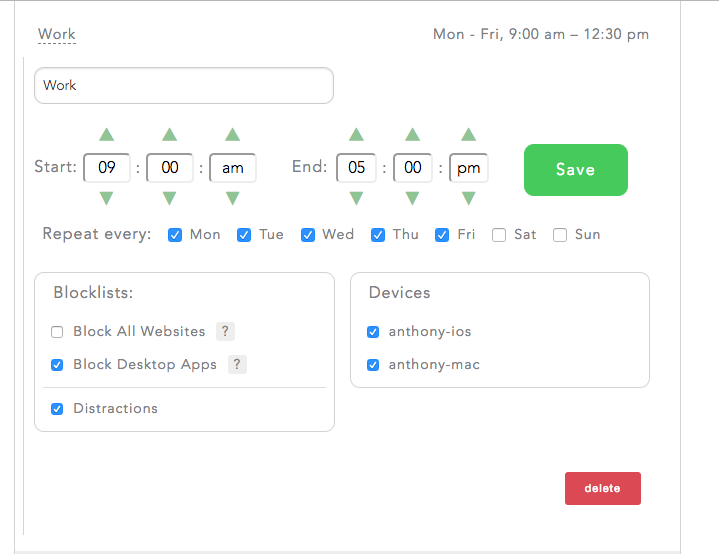 We are working on scheduling and locked mode improvements for Freedom now, including the ability to add devices and blocklists to active sessions, giving more flexibility for users to delete sessions, and so on. We hope to get this improvements rolled out in the first quarter of 2019!